With drought and climate change conspiring to push California’s summer wildfire season into premature overdrive, the state’s lead wildfire agency has acquired a multimillion dollar arsenal to help it cope with unprecedented numbers of dying trees. California recently bought $6 million worth of chippers, mobile sawmills, portable incinerators and other equipment to help its firefighters remove some of the nearly 30 million trees that now stand dead across the state, killed by drought and insects. The equipment is being used as parched southern California landscapes explode in the types of summertime flames that wouldn’t normally be expected until August. Grasses that fattened up following winter storms in central and northern California are expected to fuel major blazes in the weeks ahead. The California Department of Forestry and Fire Protection, normally called CAL FIRE, which is charged with protecting tens of millions of acres of mostly private land, responded to about 250 fires last week — an unusually large number for mid-June. On Tuesday, CAL FIRE was working with other agencies to try to contain two major blazes in southern California as firefighters in other southwestern states also battled big fires amid record-breaking heat. The fires are being fueled by droughts exacerbated by warming temperatures, which scientists have linked to climate change and to the natural whims of the weather. Even as firefighters in California toil to battle the extraordinary blazes, they’re being forced to deal with another extraordinary phenomenon: the widespread dying of trees. About 30 million trees across the state are estimated to have died, succumbing to attacks by beetles because of the weakening effects of drought. “It’s the drought that sort of sets it off, and then it lets the beetles get out of hand,” said Roger Bales, a professor at the University of California, Merced. Gov. Jerry Brown declared an emergency in the fall because of the unprecedented die-offs, helping to free up funds needed to remove and dispose of some of them. CAL FIRE hired hundreds of seasonal workers early this year to help remove dead trees and clear out other potential fuel for fires. While ecologists value dead trees as natural assets that provide holes and logs needed by wildlife, firefighters view them as safety hazards that can crash down on roads, power lines and homes and that could potentially fuel bigger blazes. A group of ecologists formally objected to the emergency declaration, arguing in a letter to Brown that dead trees are natural and necessary parts of Californian landscapes. They pointed to a growing body of research downplaying the wildfire hazards posed by trees killed by beetles. One of those ecologists, Chad Hanson, director of a small California nonprofit, says he agrees that dead trees that pose falling hazards should be removed. But he said trunks should be left on the ground to provide habitat instead of being incinerated or removed. “Once you fell the trees, they’re no longer a hazard,” he said. Summertime fires in California cause less property damage than the fires that are fanned by dry Santa Ana winds in the fall and winter, but they sap more firefighting resources, research published last year showed. While the effects of climate change on Santa Ana winds fires remain riddled with uncertainty, scientists are generally convinced that the parching effects of global warming will lead to bigger, longer and more damaging summertime blazes in California — if they aren’t already doing so. That suggests the intense and early summer fire seasons in this and other recent drought-stricken years may have been less an aberration and more a bellwether of something that CAL FIRE officials frequently describe as a “new normal” for firefighters. With more greenhouse gas pollution piling into the atmosphere daily, continuing to warm the planet toward a 2°F increase from preindustrial times, and with warmer weather exacerbating droughts, mass tree die-offs could become routine features of Western landscapes. 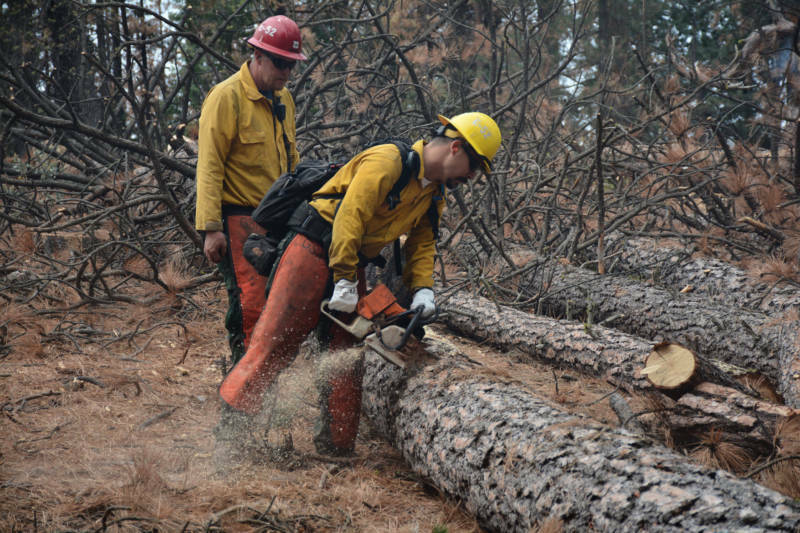 Not only would that eliminate or shrink some forests, driving them northward or uphill toward cooler climates, it could also force increasingly overworked firefighting agencies to juggle the additional routine task of managing dead trees. CAL FIRE is focusing its tree removal efforts in areas where most trees have died and where the dead trees pose the most immediate dangers.